Let’s say you have in a cell 1150 minutes written, and you want to convert it to Hours. Cell A1 has 1150 written, we are writing the =CONVERT formula in cell B1. 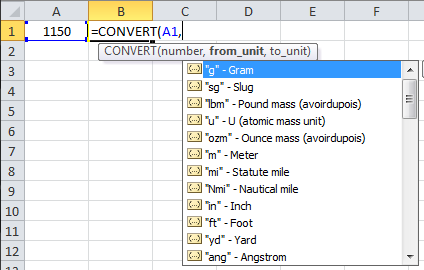 The ‘From’ and ‘To’ units need not be typed manually, there will be a drop-down atomically given by Excel, where you can select your required unit.